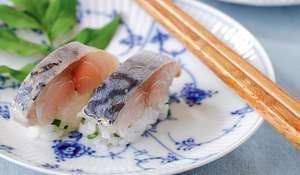 Masu, otherwise known as trout, is the star in this inviting sushi dish, The smoked trout is wrapped in bamboo leaves with shiso leaves and sticky sushi rice. Masu means ‘trout’. 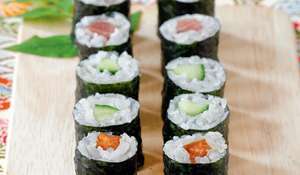 This oshi sushi is a very traditional regional food, originally from the Toyama prefecture in the mid-west of Japan. It is famously sold in bento boxes at stations, and is simple but very tasty. 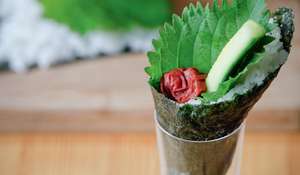 Traditionally, round wooden moulds are used, and the sushi is wrapped in bamboo leaves. 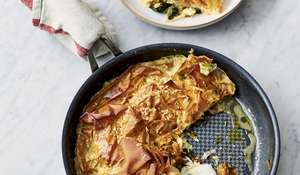 It may be difficult to find bamboo leaves so I would recommend using cling film for this recipe. You will need a 20cm-diameter mould, or loose-bottomed cake tin - a spring-form Victoria sponge tin works well. If using a cake tin, remove the base and place the tin on a flat, firm surface such as a chopping board. Line the inside of the mould or cake tin with the bamboo leaves or cling film, leaving enough of the leaves or cling film at the top to cover the sushi when it is made. Put half of the rice in the mould, to a depth of 2cm, place the shiso leaves on top of the rice, and then put the rest of the rice on top. 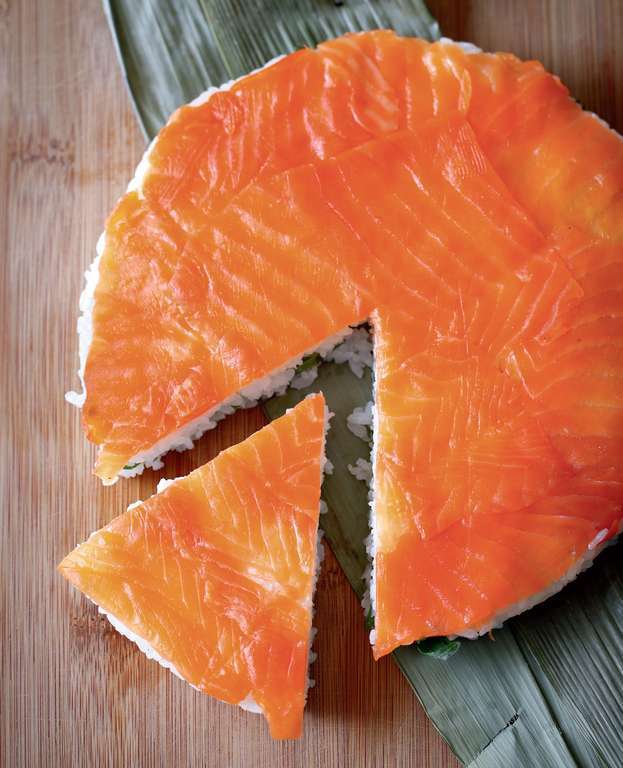 Place the trout slices evenly on top of the rice. Fold and tuck the bamboo leaves or cling film over the top, then put the lid of the mould or base of the cake tin on top and press hard. Place a weight on top (a full jam jar is ideal) and leave in a cool place for half an hour to set. You want it to become a little bit flat and to stick together. 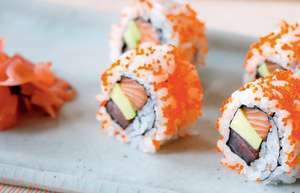 Carefully pull the oshi sushi out of the mould or tin, unwrap the leaves or clingfilm and slice the sushi into 6-8 pieces. 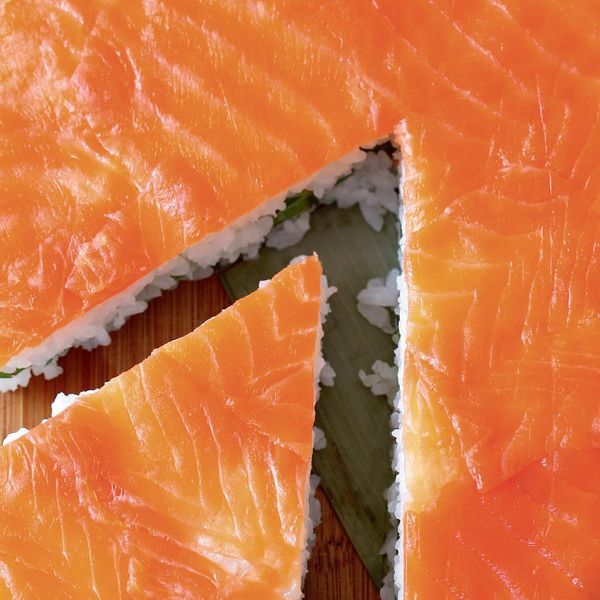 Tip: You can use smoked salmon instead of smoked trout. Who's the author? 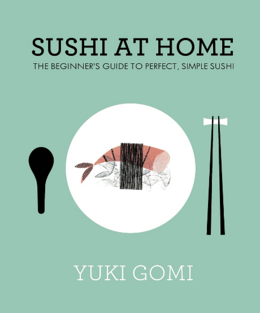 Yuki Gomi is a Japanese chef who has taught thousands of people how to make their own sushi. 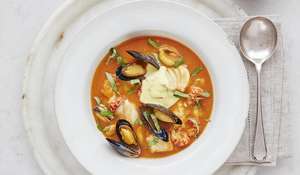 After studying at Le Cordon Bleu in Chicago, she trained under a master noodle chef, before moving to London and beginning to teach Japanese home cooking classes.